Perhaps the instrument we will hear. Among the splendors and delights of the Boston Early Music Festival, two of Mozart’s own instruments—his concert violin and his viola—will appear in Boston courtesy of the Mozarteum Foundation of Salzburg. This is a first for the United States. If you wish to see them up close, they will be on display for the first three hours of the Festival Exhibition, from 10am to 1pm on Wednesday the 12th of June, in the Revere Hotel. If you wish to hear them—and the chance to hear Mozart’s own instruments is surely not to be passed over lightly—there will be a performance at 8pm on Monday the 10th in Jordan Hall. Amandine Beyer, making her Festival on the violin, and Miloš Valent will play the viola. They will be joined by Kristian Bezuidenhout on fortepiano, and Eric Hoeprich on clarinet. The all-Mozart program is as follows: Sonata for violin and piano in C Major, K. 303 (293c); Prelude and Fugue for piano solo in C major, K. 394; Trio for clarinet, viola, and fortepiano in E-flat Major, “Kegelstatt”, K. 498; Duo for violin and viola in G major, K. 423; Sonata for violin and piano in D major, K. 306. There will be a talk before the performance (starting at 6:30pm), with the President and the Head of Research from the Mozarteum Foundation, Johannes Honsig-Erlenburg and Ulrich Leisinger. WGBH is also sponsoring a live broadcast around these instruments—see the last paragraph. It is always a fascinating to hear an instrument a great composer once played. The belief that we may understand the music better by hearing exactly what the composer heard is persistent and natural. Yet it is a risky belief, not because it is wrong in any essential way, but because there are so many ways in which the instrument we hear today may differ from what the composer knew. It may have been altered—merely to repair what was broken, or to suit passing fashions or changing aesthetic ideas—in the time since it left the composer’s hands. Time alone, even without human intervention, will alter the sound and shape of a instrument. Even the traditions and documentation from which we conclude that the instrument did indeed belong to the composer may be faulty. Many harpsichordists, for example, were convinced for much of the 20th century that we possessed the Bach harpsichord—and yet it was eventually revealed to have been not only reconstructed in the 19th-century beyond any resemblance to its original design, but also never to have belonged to J.S. Bach in the first place. In the case of Mozart’s violin and viola, however, we are much luckier. The documentation of both instruments has been rigorously researched, and both can be traced from person to person back to Mozart’s sister Nannerl, to whom Mozart apparently entrusted his violin when he left Salzburg, and to Mozart’s widow Constanze, who inherited his viola. The viola, sadly, was altered in the 19th-century to bring its size down to the standards of the time. The violin, however, remains almost entirely unaltered—rare for any violin of such an age. Even the fingerboard—one of the parts which was most commonly lengthened in any 19th-century alterations to violins—is original. Matthias Schulz, the Managing and General Artistic Director of the Mozarteum Foundation in Salzburg, gives more details. BMInt: So, who built the instruments, where are they from, and when were they built? Matthias Schulz: The Mozarteum Foundation was able to buy the viola in 1966. This instrument is from an anonymous master of the early 18th-century from northern Italy. Unfortunately the instrument has not been preserved in its original state. That is actually one of the things I wanted to ask about—how much of the instrument is actually in a condition that Mozart would recognize? What changes have been made over the years? The viola has a remarkably warm tone, but has probably lost some of its former volume as a result of the adaptation of its size, but it’s a really very nice-sounding instrument. It was reduced to standard size during the 19th-century by cutting off the margins of the top and back considerably. It is assumed that the instrument originally was at least 13mm longer. At the same time, the original scroll was replaced by a new one taken from a German or Austrian instrument. The violin is more or less in its original state. It was built in Mittenwald, a community located 60 miles south of Munich, along an important trade route to Italy. It established itself as a very important center of violin making in the final decades of the 18th-century. The Mozart concert violin was most likely built by a member of the violin-making family Klotz, and was built in 1700 or a bit later. The Mozarteum Foundation bought it in 1956, ten years before we bought the viola. 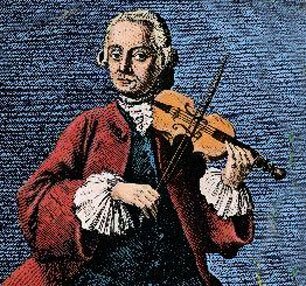 The violin is really a remarkable document of what Mozart understood of the violin sound—[it] really gives a big picture and a very good impression of how he felt the sound and how he heard it. It’s really in a very good and original condition. Do you know the history of the instruments? How did the violin come to survive in such good shape? Who owned them since Mozart? That’s quite a complicated story, but the earliest evidence for the violin is a certificate by Marie Trestl from August 1842, stating that the instrument had been acquired by her father, Leopold Trestl in 1820 from Mozart’s sister, Nannerl Mozart. Around 1879 the instrument was in the personal possession of Adalbert Lenk—he was a violin professor at the Mozarteumand the violin remained in private possession until it was acquired by the Mozarteum Foundation in 1956—we bought it from the family of Josef Brandner. The fact that the instrument was not modernized in the 19th century makes it clear that it was regarded as a relic early on. So it is really in a very very good shape. And if you come to the Boston Early Music Festival where we will present the instruments, we will have a baroque violinist, Amandine Beyer, and you really can hear it in a fantastic situation, in a trio, and it gives a great impression of the sound of Mozart’s time. Is it known how many other instruments that belonged to Mozart survived? We have the violin, the viola, and the Kindergeige—the small violin he had as a child in Salzburg. And there exists possibly also another Mozart violin that we are currently looking at. We are very curious—we are investigating whether it is really a true Mozart violin or not, and a lot of research has to be done. Currently we own these three instruments, plus a piano—the Mozart piano, and we are very happy about that. How difficult was it to verify that this violin and this viola actually belonged to Mozart? This is a very long process. You really have to see who the owners of the instrument were, and there are a lot of hints you can follow—a very long and difficult process—and of course, especially with these instruments—you can never guarantee it 100%. But because our research department do this very carefully—it is very important—we can be nearly 100% certain that this is the case. There exist certificates, and you can see from letter, from the history of the owners—a lot of research is done around this, and a lot of information is collected, and at the end of the long process we are absolutely sure that this is the case with these instruments. How often do the instruments get played? Quite often. The Mozarteum Foundation has three different parts: the Research Department is one part, and we have the museums, the Mozart Birthplace and Residence, and then the third big part is the concerts. Our most international Mozart festival is the Mozart Week, at the end of January—11 days around Mozart’s birthday on the 27th of January, and within this international festival we always have one or two concerts in Mozart’s Birthplace and one or two concerts in Mozart’s residence, and there we always use his original instruments. We have also a huge youth program, and there we show them the instruments and tell them the whole story. This is done very regularly. In the middle of June there is a series of concerts, and there have been concerts in cities where Mozart was—German cities in this case—and the starting point is here in Salzburg. We have concerts in the Tanzmeistersaal of Mozart’s Residence, and there we present his piano. And how many people are allowed to play on these instruments? We work together we a few artists—it is of course important that this is an artist we believe in, we trust in. For example, a baroque violin player like Amandine Beyer—she never played on this instrument before but she is one of these artists we know and we are absolutely confident that she will do it perfectly and show the best qualities of the instrument. And we have two people here in Salzburg who are allowed to play on them and do this regularly. But especially with these concerts we do within the Mozart Week, or if we go to the Boston Early Music Festival to present the instrument in a concert, then we work together with international artists, who come to us and test the instruments before they rehearse very carefully. And it is always important that two of us are part of it—due to insurance reasons, if we travel with the instrument, two [people] of the Mozarteaum Foundation have to be with the instrument always. Even if some artist is rehearsing, then two of us are in the room. So will bringing them to Boston be quite an expedition,? It is, it is. But we are coming with six people from the Mozarteum Foundation—for us also, it is a great and very important event in any case, and it is also important for us to present our activities and what the Mozarteum Foundation is doing, and how we try to keep the heritage of Mozart alive in the best way. And how will you manage the flight? So many instrumentalists these days have so much difficulty bringing their instruments on airplanes—how will you manage it? Yes, you have to do quite some paperwork before. But we are taking them as our hand luggage. Two people from the Mozarteum Foundation have to accompany them and take them with them all the time, even in the plane. Not part of the normal luggage, you know! It’s very exciting, although of course something like this is a certain risk, but I think it’s important to show what this is, and to present it in the US. We are very much looking forward to it. There will be another chance to hear (on the wireless and in the studio) and see (if you hold a coveted invitation) the instruments. On Wednesday, at 7pm on June 12th, WGBH’s Fraser Performance Studio will host a showcase/concert. Picking up Mozart’s violin and viola will be two of Boston’s most honored period-instrument performers: violinist and Aston Magna Festival artistic director Dan Stepner, joined by violist Anne Black and other members of Aston Magna. The centerpiece of our night of Mozartean chamber works will be a rare performance by Stepner and Black of one of Mozart’s Duos for Violin and Viola, a work tailor-made to showcase the qualities of both instruments. According to Stepner, “these duos are distillations of the art of chamber music as much as in the quartets by Haydn. Mozart Comes to America also will include a presentation by Matthias Schulz, CEO and artistic director of the Mozarteum Foundation by Gabriele Ramsauer, director of the Mozarteum’s museums and personal chaperone for the two priceless instruments. Question: will these instruments actually be played at the 6:30 pre-concert lecture?